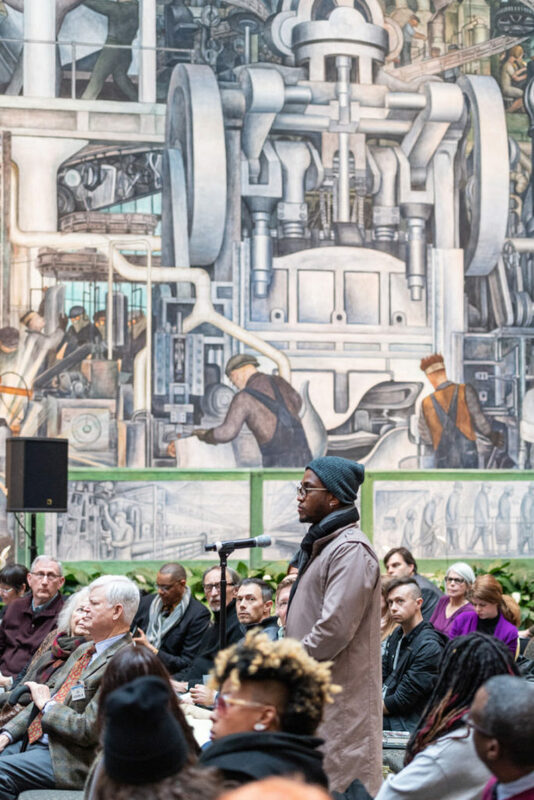 U-M faculty Anya Sirota and Harley Etienne are on stage at the Detroit Institute of Arts to present their final plans for reshaping public areas around the 12 cultural and educational institutions in Midtown as part of the DIA Plaza Midtown Cultural Connections Competition presentations. Scott Soderberg, Michigan Photography. 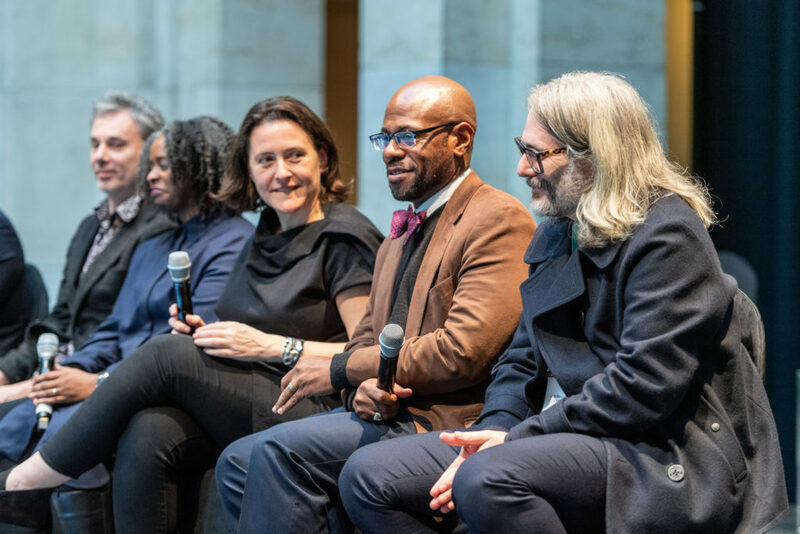 When Craig Wilkins looked out into the audience during his team’s presentation at the Detroit Institute of Arts this week, he was happy to see many of his University of Michigan students in the crowd. Craig Wilkins, a U-M lecturer in architecture and member of team Ten x Ten, answers questions during the DIA Plaza competition presentations. Scott Soderberg, Michigan Photography. 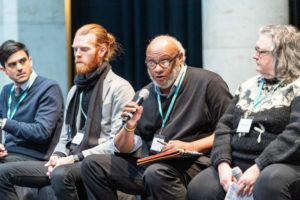 Anya Sirota, U-M associate professor of architecture and principal at Akoaki, Harley Etienne, assistant professor of urban and regional planning, and John Marshall, associate professor of art and design and co-founder of design studio rootoftwo, answer questions during the DIA Plaza competition. Scott Soderberg, Michigan Photography. 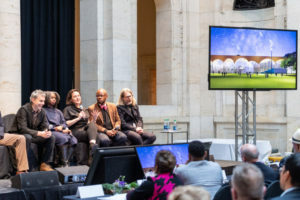 Anya Sirota, associate professor of architecture and principal of design duo Akoaki in Detroit, talks about the proposed canopy that would rise high and flexible as a DIA addition. It would be used to exhibit new works, large-scale exhibits and events. Scott Soderberg, Michigan Photography. 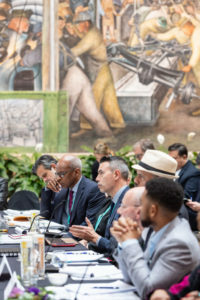 Jonathan Massey, center, dean of the Taubman College of Architecture and Urban Planning, listens to presentations during the DIA Plaza competition. Massey is a juror for the competition. Scott Soderberg, Michigan Photography. A jury that includes Jonathan Massey, the dean of Taubman College, will weigh in on the winner to be announced this spring. 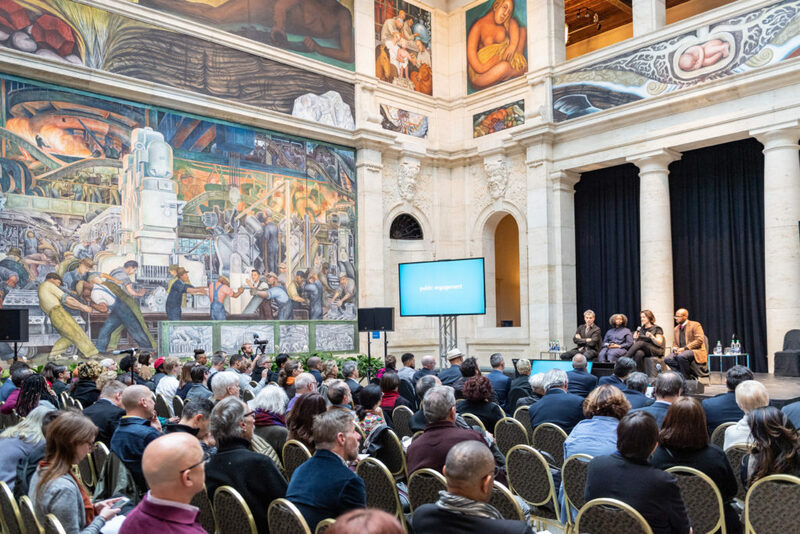 Finalist teams take questions from the audience during the DIA Plaza competition at the Detroit Institute of Arts Riviera Court. Scott Soderberg, Michigan Photography.